Amazing Debut for B.N. Toler! A Paranormal series so different from the rest I hate to call it a PNR! Healers, such as Aldo Lawson understand the power of their gift, although at times, it seems more a curse. 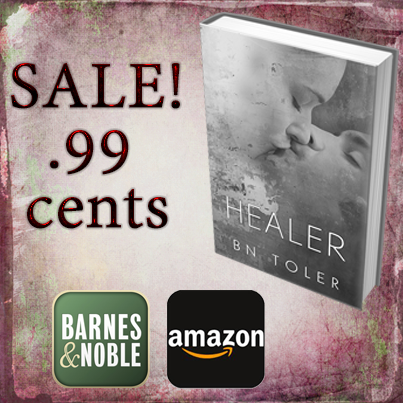 Upon meeting a handsome young healer named Thomas, Aldo's life heads into a tailspin. With his arrival, Aldo's aunt, the woman who raised her, is forced to share a hard and scary truth--vampires exist. And not only do they exist, but they thirst for healer blood. Aldo's world is turned upside down when her aunt is murdered and Thomas disappears. Riddled with questions, she sets out to find him. Is the book perfect no, it is a first novel by a very new writer however, that being said holy cow! this is a breath of fresh air in the Vampire genre. In fact, it is not so much a Vampire novel as it is a truly paranormal novel. The writing is fabulous and as you keeping reading the novel it gets better and better. Her characters were interesting, in some places sketchy but since this is a 3 part series I think a lot of the blanks will be filled in as we make our way to the ending of book 3. Aldo is an interesting character although at times confusing but confusing in a young girl way. She struggles with her feelings and fears. She has the normal teenage angst and behaves as expected around a cute older guy. Thomas is a mystery from moment one and that is what keep us readers on our toes right until the end and actually even then I was chomping at the bit for the next one. The book started out writing from Aldo's "present" and then we are faced with chapters bouncing from present to 6 years before. I was a bit confused at first but muddled my way through and got used to it. I wonder if a simple chapter title would make this a smoother transition? Apart from that the story flows with it's bends and twirls and sudden change in direction then twisting once again. I admittedly was finding myself flabbergasted in the last 1/4 of the book. The spins were enough to make me want to read all night. Starting a world from scratch is difficult for even the most experience authors and even then the first book of the series is often the worst as there is so much to explain. BNT did this seemlessly and using the different points in time as a vehicle to further her plot and keep the story moving. Brava Ms Toler on an excellent first book and I can't wait for 2014 to read the next book in this trilogy! Toler's name is now in my *watch* list and with writing this good I know her future books will be amazing.